At the end of last semester, there was a snow storm that left approximately 10 inches of snow on the Wake Forest campus. In preparation for the snow, you might remember salt being spread on sidewalks, pathways and roads. If you are from a place where it snows regularly, you probably know why this salt is used, and you might have even had to spread some on your driveway yourself. 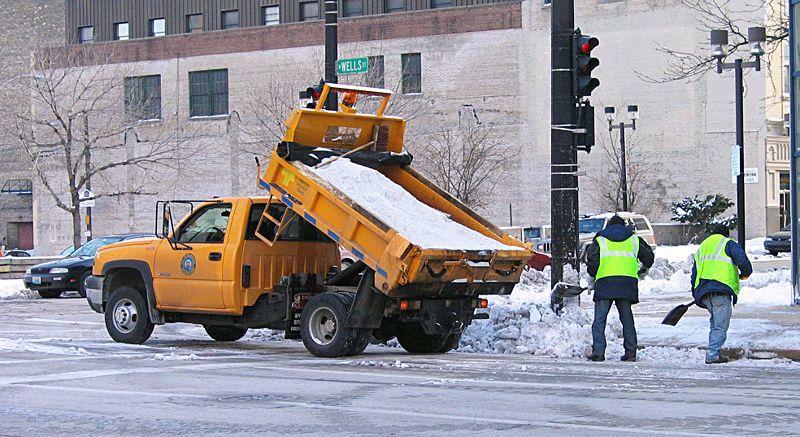 Even people who are from somewhere where it does not snow regularly might know salt’s seemingly magical ability to keep the roads clear and free of ice, but how exactly does road salt accomplish this goal? The road salt used to break up ice accumulation is called halite, also known as “rock salt,” which is essentially the same as the table salt you use to add some extra flavor to your dinner in its most natural state. We take special care to purify the salt before it can be consumed, but road salt does not go through this purification process. If you have ever seen road salt up close, you can easily spot the impurities in the salt; each large crystal typically has forms of debris and can have brown-grayish tinting. Due to the low cost and easy maintenance of these large crystals, road salt is an excellent tool for keeping ice from accumulating by actually lowering the freezing point of water. As many of you may have learned in one of your middle school science classes, water freezes into ice at 32°F. Through freezing point depression, road salt lowers this temperature threshold. Different salt concentrations can lower the temperature needed for ice to form, ranging from temperatures around 20°F to a temperature of 2°F. This freezing point depression means that temperatures colder than freezing are necessary for ice to form. The road salt is more effective if it is wet, which is why the trucks you see before a snowstorm often spread brine, a mixture of salt and water. When these trucks go to work after the precipitation begins to fall, they only have to spread the road salt because the salt is activated by the moisture in the precipitation. Through this process, snow is prevented from forming ice, and ice is prevented from accumulating during a harsh winter storm, making it safer for us to be out on the sidewalks and roads sooner. However, using road salt can have a few negative effects. The spreading of salt may contribute to some environmental problems. The impurities in road salt (contaminants including lead, phosphorus, etc.) are spread back into the environment through leaching, which is the process of draining minerals out of a substance with percolating water. Additionally, if the actual temperature of the roadway is low enough and there is already ice, spreading salt will not make much of a difference. If there is already ice, it is difficult for the salt to actually penetrate the solid crystalline structure of the ice. Road salt does a better job at preventing ice accumulation or breaking it up as it forms than it does at melting ice that has already formed. Regardless of these issues, road salt is still the most common measure that is taken against ice accumulation. Overall, using road salt to prevent and break up ice accumulation is a cost-effective way to keep roads, and therefore people, safer with minimal negative effects. This mineral is an amazing tool that shortens the time that people have to be stuck away from work, stores or family. As winter weather continues to occur this semester, you can expect to see road salt at work on the streets and sidewalks breaking up ice and making transportation easier and safer.